Chocolate treats wait to be auctioned to support youth in Arlee. Desserts are auctioned off to the highest bidder. Arlee Girl Scouts serve samples to attendees. 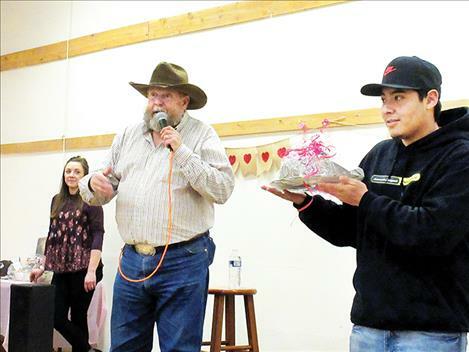 ARLEE – Auctioneer JR Strand had never seen a three-way tie for the top honor at the Arlee Chocolate Lover’s Festival, but he did this year after attendees tasted 10 dishes and voted to select the crowd favorite on Feb. 13. This was 15th time the annual event was held by the Arlee Community Development Corporation to raise funds for youth programs and the summer reading program at the Jocko Valley Public Library. 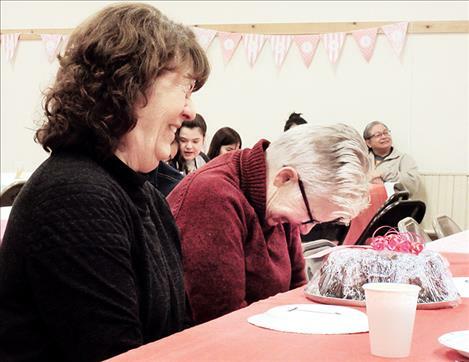 Members of the Arlee CDC decorated the Arlee Brown Building’s main room in a Valentine’s Day theme for the event. The 10 bakers who entered their desserts in the auction made two identical dishes. One was auctioned and the other was available for tasting. Entries included brownies, fudge, cookies and cakes. 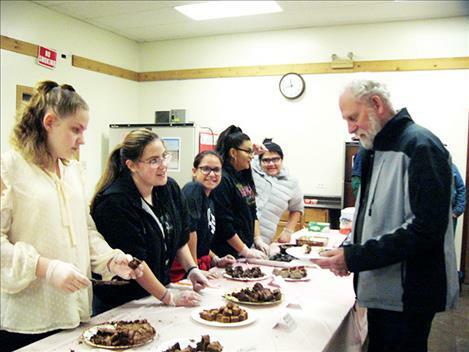 Arlee High School students made many of the desserts. Attendees paid a few dollars for the opportunity to taste all 10 treats. 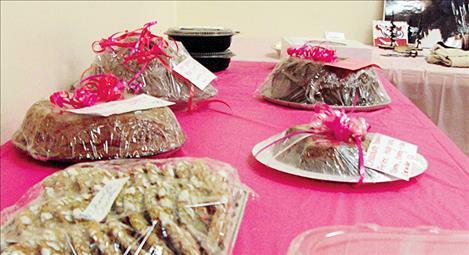 Volunteers with the Arlee Girl Scouts dished up the sweets for nearly 40 attendees. During the tasting, attendees visited over their desserts and children played Twister. A member of the CDC spoke at the event. She said currently the central focus of the organization is on building communication in the community. The CDC provided a comment box at the event for attendees to share feedback on CDC activity and suggestions for future events. Founding CDC member Donna Mollica said the wintry weather limited the attendance at the festival; however, she said the event showcased the leadership of a new generation of CDC board members, many who have joined the organization in the last year. “They’re building up this organization,” she said. The auction was the main event of the night. Friendly bidding wars resulted in donations of up to $125 for a single dessert. 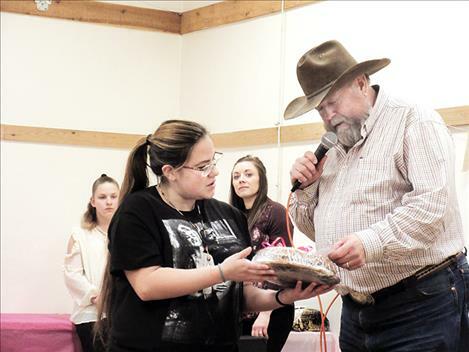 While auctioneering the items, Strand sprinkled the event with humorous cowboy poems. He donates his services as an auctioneer to the event annually. After a festive evening, many lucky bidders headed out into the snowy night carrying decadent chocolate prizes.